Web Series Today: Doris Shades from Shades Of Bad introduces you to a cruise ship in the spin off travel show. 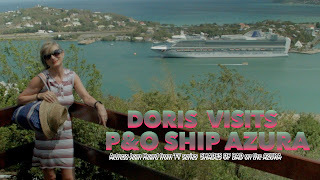 Doris Shades from Shades Of Bad introduces you to a cruise ship in the spin off travel show. Shades Of Bad web series shooting abroad. If you have never cruised, then Doris Shades has the ideal information video. 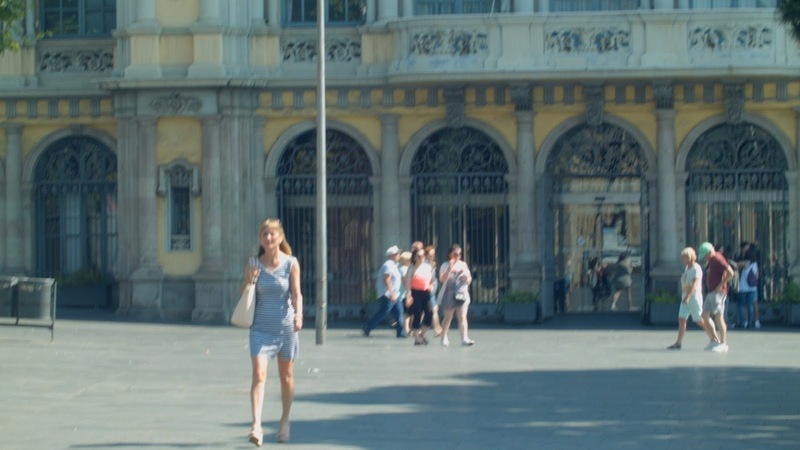 Shot on the same Black Magic camera the web series is shot on, and with just as many edits and cuts, it is one of the many travel show spin offs now feeding back to the drama series. On this ship the final episode of season 3 was shot, some clips have found their way into promos even though the episode is not scheduled to go live until 2nd September. Before then, starting next week, Doris has been sent to Norway to collect a package, and all of that was done while on the Azura. You will already have seen in episode 43, the arrival of new star Derek Redmond who sends her abroad. Click here to catch up. The Barcelona episodes are due to go live after the Norway episodes which run for about ten shows. Barcelona episodes were shot while on the Britannia. The ship stops for about six hours and during that time considerable inserts for two episodes were shot with Manuel Martinez, actor Gary Keates. The tour of P&O Azura is one of our many films, please visit our YouTube channel and subscribe free. 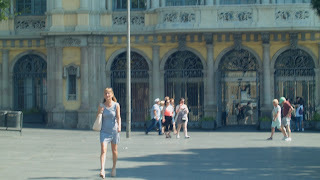 P&O AZURA cruise ship tour and review is below at the end of this blog. In it I tour the cruise ship Azura walking through all the major features of the ship. This was done on a tour of the mirror like still Fjords in 2015 and then on a Caribbean cruise in 2016. This adds to the many films I have of cruise stop destinations from Fiji to Barbados, and gems like Bequia or botanical gardens. These help you orientate and choose before you travel. I have also listed the cruises, by their cruise number in playlists that contain the films of the cruise stops in order. I wish I had started earlier as I only have stills of Asia, India and previous cruises in the Mediterranean but I am playing catch up. Next I am off to St Petersburg in Russia. I have tried to list most of the new Caribbean season cruises with playlists on our channel, please subscribe to the channel and help circulate to those interested in cruises. For those of you who have never cruised then I hope this helps you. The ships are all totally different so it is a case of finding the cruise you want. Within the larger ships no two people will have exactly the same experience. You can be exclusive and you can party and play. Some people prefer a small ship, others a large ship which is more like a city. The Azura came into service in 2010 and was named by Darcey Bussell. It has so many features you will find it hard to discover them on just one visit. The Azura is a mid size ship that takes 6 minutes 11 seconds to stop when at 24 knots. Normally the ship only turns at one or two degrees to correct course, but the Azura can go over to 35 degrees. She can carry 3145 tonnes of fuel and at 23.5 knots is using 260 tonnes per day. There are 900 cabins with private balconies and a number of staterooms. It has stabilisers that go out when seas are rough. Cruising can be a totally casual affair, buffets and never needing to dress. Or, they can be an excuse to dress up and engage in formal nights and visit the fine dining spots. Cruising can be about 'Food Heroes'. Like many celebrities they can be found visiting on some cruises and they leave their mark and menus. Select dining and fine wines are part of cruise life like dressing up for formal nights. The Atul Kochhar's Sindhu restaurant, Olly Smith's Glass House, the Epicurean experience, the Beach House and others are all mentioned. If you need more information take a look at the P&O Fine Dining page. normally has about 1174 crew to 3000 passengers. P&O have a great web site and list many details and crew there. Azura is a stylish ship that was built by Fincantieri in Italy, started in 2008 finished in 2010 and has a gross tonnage of 115,055 MT, its displacement is 53,967 MT. Length is 288.6 meters and width is 36 meters which is 2 meters too wide to go through the Panama Canal. The bridge is 50.5 meters wide. Deck 15 and above is made of aluminium, the decks get lighter as you go up. The heavy plant, engines and sewage pumps, propellors and fresh water making equipment put most of the weight at the bottom. Fresh water is made by 3 large evaporators that can produce 90,000 gallons per hour. If you are thinking of a first cruise, then the Azura is not a bad choice. You can then decide if you wish to try a smaller or a larger ship, or, it's sister ship the Ventura. Here is my tour, please share. Please subscribe to our YouTube Channel and review some of our other films.